Tuesday nights at Eight Row Flint give Agricole Hospitality chefs the opportunity to cook the food that personally inspires them. They grill, cook with live fire and step outside the daily menus of Revival Market, Coltivare and Eight Row Flint. The series shines a spotlight on the rising stars within Agricole and gives them the change to cook with guest chefs like Theodore Rex's Jason White or Fluff Bake Bar's Rebecca Masson. 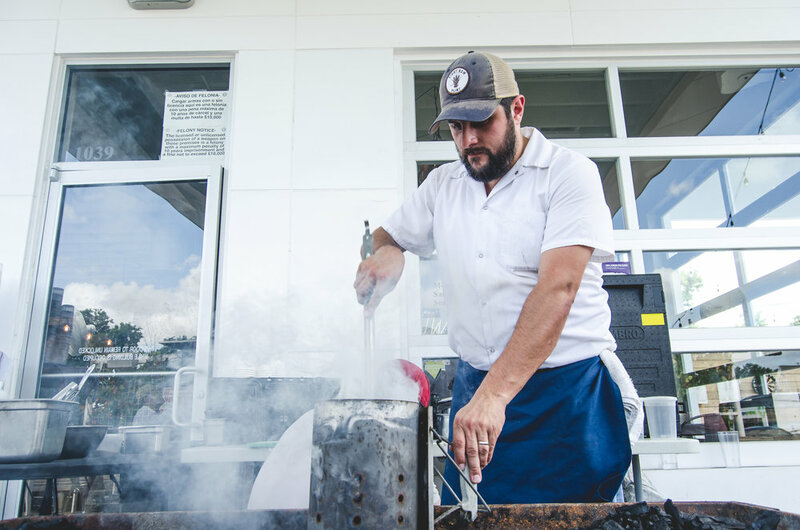 For the past two years, Eight Row Flint chef de cuisine Marcelo Garcia has been planning, executing and, in many cases, cooking for these special nights on the patio. We sat down with Marcelo to get the inside scoop on the program. Why did you and the team create the Outdoor Cooking Series? The cooking series is something that [Agricole Hospitality culinary director] Vincent [Huynh] started right after Eight Row opened as something "extra" that we could offer our guests. 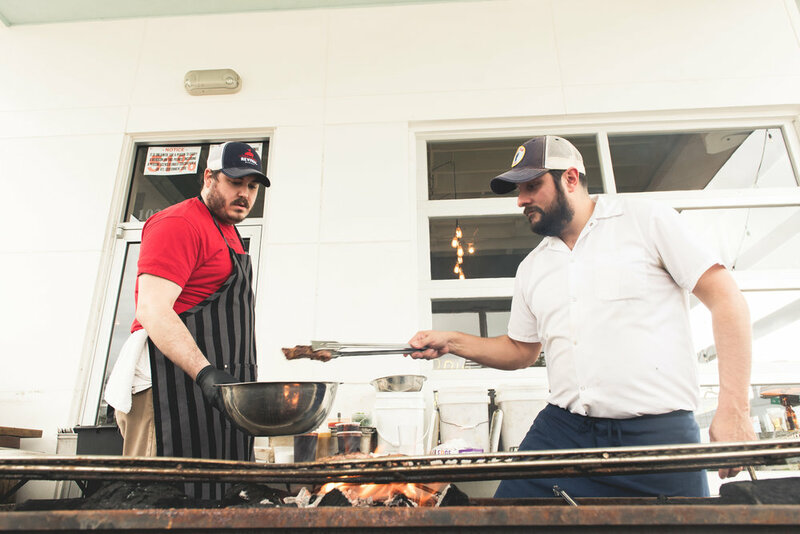 Coltivare is closed on Tuesdays, and Revival Market is not open in the evening, so he enlisted the cooks and chefs from within the company to come and cook on the patio. I was still at cooking at Revival at the time, loved the idea, and cooked fried chicken on the patio during the first summer of the series. After a successful first year, Vincent handed off the cooking series to me. A lot of planning and prep go into the Tuesday night cooking series, and jokingly, Vincent told me to "figure out a way to make it work." My first Tuesday night leading the charge was Burger Night, and I asked my wife Kaitlin (a cook at then-Oxheart, now Theodore Rex - also closed on Tuesdays) to cook with me. I immediately realized that this would be my contribution to the series--asking my friends to cook with me. I started making calls, and the response was amazing! My first guest chef was Jason White, chef de cuisine at Theodore Rex. We have had a lot of fun with Tuesday nights, and it continues to evolve. It's great cooking out on the patio, talking to our guests, and letting them know what's in the works at Eight Row. Really, I couldn't ask for much more. I get to do what I love, and our guests have made have embraced Tuesday nights on the patio. Right now, you're serving Eight Row Flint BBQ plates. What makes a BBQ plate at Eight Row different than other places around the city/Texas/country? Barbecue is a tricky subject. It's a Texas staple. Eight Row Flint isn't a barbecue spot, but we do have the capabilities to put out a killer barbecue plate. We smoked the brisket and made the sausage over at Revival Market, made Sam Houston's BBQ sauce, started a batch of pickles, and got some Louisiana shallots from Covey Rise Farms. I made some slight variations to a traditional barbecue plate by serving the brisket and sausage as a skewer, grilling the Louisiana shallots, and doing a broccoli slaw. It's our take on a BBQ plate, and with the rodeo taking place, it seemed like a fun idea. What has been the most challenging dish to cook outside? Why? Todd Patterson (of Revival Market) did an Izakaya night with multiple Japanese-inspired dishes not long after we launched the series. We were still new to grilling on the patio, and we didn't know what we know now. Needless to say, it was a challenging night, but we learned from it, and everybody enjoyed it! Every week brings a challenge. The weather plays a huge role in the success of the night as well. When it comes to food, if it's not a challenge, where is the fun in that? What has been your favorite dish of the series? Why? 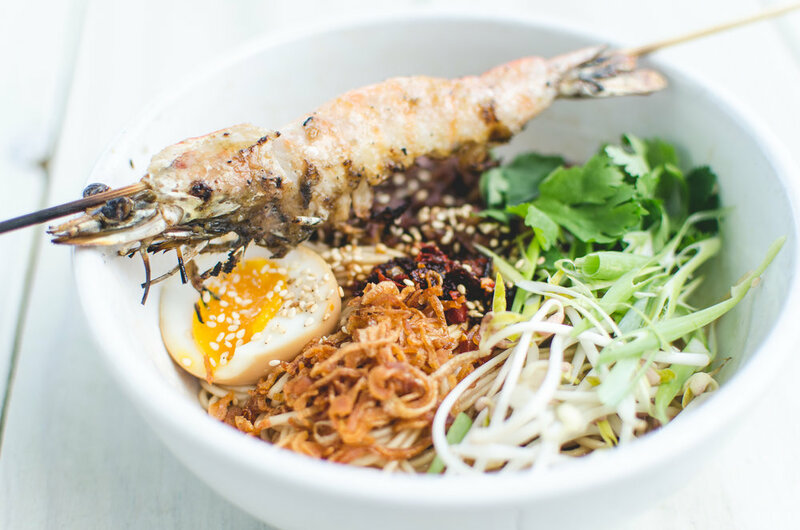 Last year, Sam Chang (formerly of Oxheart) made a Taiwanese Slack Noodle dish. He had just returned from vacation and wanted to cook this dish that he was very fond of. A lot of prep and love went into the making of the dish, and the end result was amazing! The balance of flavors, spice and texture was pretty amazing. I'm going to ask Sam if he wants to come back and cook with us again. Everyone deserves to try that dish! Why do you think this series resonates so well with Eight Row Flint guests? I like to think that we make it fun and approachable. We're out there grilling and having a good time, and it just sets a mood for the night. 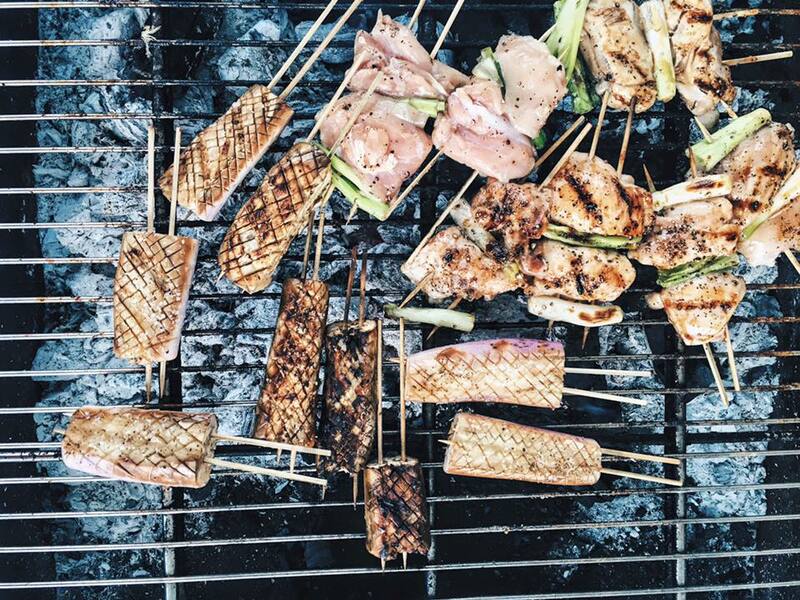 Grilling is a social event, and the guests have really embraced it. Can you share any outdoor cooking tips? You know, I was not really the grilling type before this. I loved being the kitchen, but never opted for the backyard. Obviously, that has changed. Grilling has a lot of variables. Most importantly, you have to keep your fire going. Finding that sweet spot with the fire makes things so much easier. After that, time management is key. Cook for a final dish, not a final ingredient. 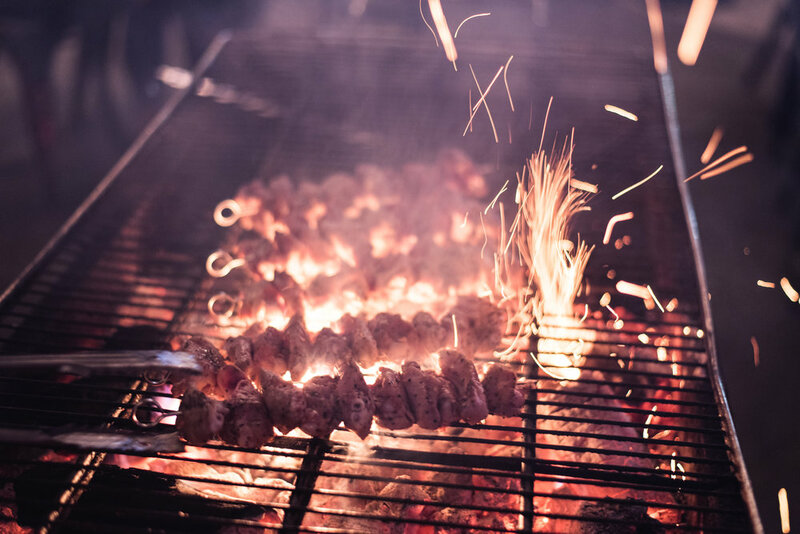 Grilling is supposed to be fun, so make it just that. Other than that, if anybody has questions, you know where I'll be on Tuesdays. Who is your dream guest chef (anywhere in the world) to cook with as part of this series? So this is where I have to reveal my chef crush? Massimo Bottura, hands down! I have so much respect for him! My wife and I had the pleasure to eat at his restaurant, Osteria Francescana, while we were on our honeymoon in Italy, and it was an unbelievable experience! I'd love to see what he would do on the grill! What can we expect for the future? I'll tell you what, the future is a hard thing with chefs! I'm usually setting up guest chefs at the last second. But, I've got some fun ideas for the rest of this year that I'm trying to finalize, so stay tuned. As for next year... I'm "going to make it work!"